The guy who was the Governor of California for two terms? And look at the mess its in now! Unless you are thinking of the other third rate actor with the bad accent that was gov. could be, just stay away from actors and blow hards, trump fits into that catagorie. ever help the country, it is just trying to get votes. I think the best people to be president wouldn't touch that job with a ten foot pole. Oh late night TV will be a buzz with the Donald..
Velcro may be an option on the windy days. no corporate world is honest. What a Racist wind bag Donald Trump is.. what an idiot.. This is just all Media hype to get attention.. the old fart likes the sound of his own voice. "I'm really rich." 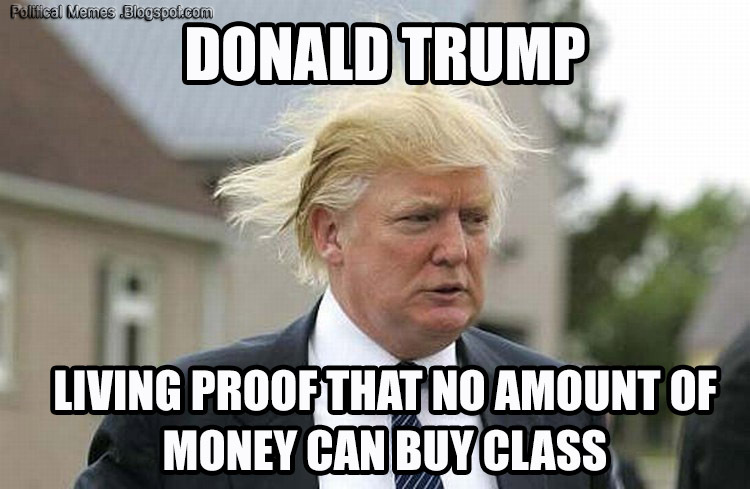 you'd figure he could pay for better hair. Also in case people think he's a brilliant business man.. he filed bankruptcy 4 times.. According to The Hollywood Reporter, the email was sent June 12. "We are looking to cast people for the event to wear t-shirts and carry signs and help cheer him in support of his announcement," the email said . "We understand this is not a traditional 'background job,' but we believe acting comes in all forms and this is inclusive of that school of thought." Business Insider called Extra Mile about the accusation. The woman who answered the phone hung up after we asked our question. Subsequent calls to the company reached an answering machine. Trump and his campaign spokesperson did not respond to requests for comment. As he began his speech, Trump remarked that there were "thousands" at the event. In our estimate the crowd was much smaller . However, a Trump spokesperson said the audience included many people in his headquarters, Trump Tower, who may not have been visible to the press in front of the podium. "There were a lot of people probably that you couldn't see," the spokesperson said. He hates Mexicans, accept for the illegals working in his hotels, golf course resorts, and casinos, oh and of course the illegals that built his casinos, resorts and high rises. Do you know the difference between and individual filing for bankruptcy and a business filing for bankruptcy? Yes I do, but Trump was running the business, and with his track record of losing his investors money, he is lucky that he could hide behind the corporate vail of Limited Liability..
Just wonder how much of the capital was used in a shell game to fund his other ventures.. Even after an audit, I bet you there were some hefty bonuses paid out.. I am so sick of the media painting this fukking criminal azzhole like a big business success story. He's gone bankrupt using the too big to fail plan where the banks lent him so much money that they had no choice but to accept his terms or they'd all go down with him. He is not a good businessman, he's a sleazy New York huckster who has raised the art of self promotion to it's highest level. The one time I loved Obama..
all politics, and many other things are self promotion. What the hell else would you call it. Funny you should bring up the casinos. Shall we mention the failed casinos? If you can't make money with a casino ... That's like losing money selling dope. Well that was a dumb post. Are you sure you have a three figure IQ? Is it possible you misread the results? I hope he does well. Some novel ideas. And I bet he would have high expectations for those in his administration. Do you think he has no hiring skills? He didn't just fall off of a turnip truck when it comes to management. Is that the same prez who defeated the Soviet Union without firing a shot? "He" personally defeated the Soviet Union on his own, did he? You do a tremendous disservice to all of us who were in the military fighting the Cold War for two generations. That idiot mannequin "won' did he? That's a disgrace and an insult. It was a tremendous effort that involved millions. How dare you. Donald Trump: "I will build a great, great wall on our southern border." If Trump built it, it would be with illegal Mexican labour and would be a decroded piece of sh-t in just a few months like everything else he's built. It would be really tacky and gaudy. Me use metaphore. Grunt Yank don't do those. Do you really think that a serial bankrupt (casinos, for gawd sakes) is fit for high office? Last edited by Curious Cdn; Jun 19th, 2015 at 05:47 PM..